First off we would like to say thank you for visiting our space on dojo.info. The head instructor is Master Sean Gordon he has 36 years of martial experience and has been teaching for 31 years. We primarily show Ed Parker Kenpo however if you wish for more variety the other instructors teach different arts. There are 5 principles in martial arts and they are expected to be followed by student and teacher alike. We impress upon our students how important trying to follow these rules everywhere not just inside the dojo. The 5 Principles of Conduct are EFFORT, ETIQUETTE, SELF CONTROL, SINCERITY and CHARACTER. Please do not hesitate to give us a call, send and E-mail, check our Facebook page, or even stop by the studio. Anyone interested in trying out our school will get one free class to see if they like it. Pee Wee ages are 5 to 7 years old karate class is from the ages of 8 and up. We offer many other martial arts and they will be listed once we get the schedules from the other instructors. We also hold many seminars that are opened to our students and the public. Would you like more information on hours, classes and programs available at Gordon's American Martial Arts? Please contact the school with your questions. Update the details, Write a Review or Report Error of Gordon's American Martial Arts. View all Dojo in Warren or in Zip code 44481. This Chart shows the Martial Arts Styles offered most in Warren, Ohio area. 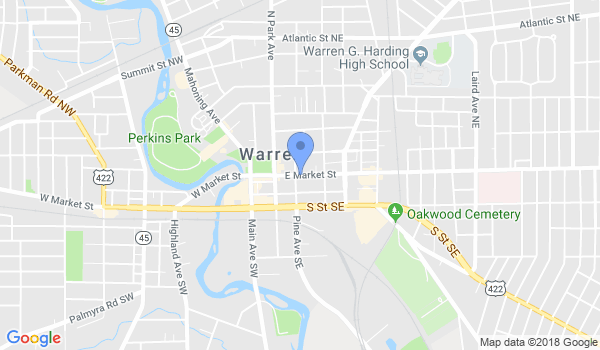 View a list of Dojo in Warren, or enter your address below to find schools closest to you.